2 Weeks Off – Keep The Focus! My goal is to write daily on this blog – is it realistic or will it be value added? I guess only time will tell. BUT, after three days of starting this blog, so far so good :). Today I head back to work after a two week Holiday break, and must admit, I could use a couple more (weeks!) ! So with the thought of heading back to work, I’m worried that maintaining a healthy plant-based, whole food diet won’t be quite as straightforward. The primary “healthy” lunch option for many at work is a questionable salad bar, or nearby restaurants that may not have vegan / plant based options. The goal to be strictly whole food, plant based requires some planning and diligent prep at home to bring meals and snacks to work that will keep the dream and momentum alive! This is no doubt a challenge for many. Thankfully there are many strategies to help keep the focus when away from home and things aren’t quite as simple. Work day snacks such as raw organic nuts, vegetables, fruits, and your favorite nut butter make for easy, and tasty treats to get you through the day. Of course couple with a wholesome lunch as needed. Our family’s initial, and relative simple strategy is to make larger food batches on the weekends, and for dinners during the week. This will hopefully ensure we have various leftover options for weekday / work lunches. Some other ideas include using the weekends to shop and prepare foods for easier and quicker meals during the week. 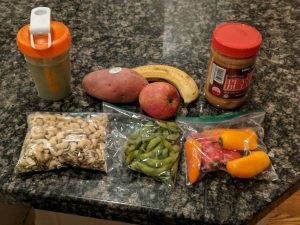 I have to say the “weekend prep” approach doesn’t sound that appealing as the weekends already seem too short, but considering your week night meal preparation and cooking will be much less, I guess it all evens out. For many of you, saving time during hectic and crunched week nights will be a big plus. Eating healthy can seem over-whelming, costly and laborious at times. But it doesn’t have to be. With a bit of planning and a little Sunday prep, you can save considerable amounts of cash while simultaneously improving health. By ensuring that you and your loved ones have routine meals and healthy snacks available, you’ll boost energy and focus, as well as stabilize moods and blood sugar levels throughout your day. Spending a bit of time on Sunday to prep your meals can go a long way to helping you save money and eat great throughout the week with little to no effort. Here are some other easy vegan meal ideas that are perfect for work, school, or play. Happy New Year & New Favorite Quick Snack! Newbie blogger (bear with me! ), healthy lifestyle fanatic, husband, and father of two! Vegan Whole Food, Plant Based – 2 Month Check In! Gratitude – An Easy Step Toward Enhanced Happiness & Health! How I Improved My Cholesterol by 20% in 5 Months – Without Medication!